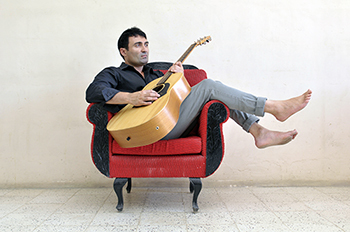 Every musician pulls inspiration from somewhere deep within, and Joseph Portelliʼs came from a mixture of family history and a passionate connection with the calming powers of music. At the early age of five, drumming vibrantly on the buckets in the washhouse at his family home in Malta was the first sign of Josephʼs rhythmic ability. A few years later Father Carmelo Refalo struck up a deal with the youngster - guitar lessons for participating in playing at church worship. The journey was never particularly easy for Joseph. His divided homes made settling hard and the challenges of the music world sometimes swayed his belief in the dream of being an artist. Unlike his high school friends, Joseph always knew his career was to be in music, but as an inexperienced talent, his passage to being discovered was a long and disillusioning one. With his mother and fatherʼs worries about him becoming a musician and “getting chickens in your head” ringing in his ears, his road to be an artist was challenging. But his love for music was far too great to be quieted. After the loss of Josephʼs cousin, his mother recalls him saying, “they can take all my money, they can leave me naked on the streets, but they cannot take away my soul and my ability to write my songs. I will recharge my soul with the only thing I have left - my family.” At this point, his mother became his greatest fan. The losses faced and blows taken over the years may have helped prepare Joseph for the darkness opposing him in the shape of his fatherʼs Alzheimerʼs disease diagnosis. Instead of letting this knock defeat him, Joseph took a fighting position and vowed to himself to raise more awareness about the disease through his music. As his fatherʼs memories aggressively slipped away, Joseph composed How The Times Have Changed, a song that highlighted the struggle his family faced in the wake of such a debilitating disease. Joseph kick-started his mission by organising a charity event to raise money for Alzheimerʼs Australia. By 2009, he was invited to compose a song to help promote Alzheimerʼs Australiaʼs advertising campaign ʻMind Your Mindʼ, and performed the song Think Ahead to go Ahead at their annual world conference in Singapore. His participation in the fight against Alzheimerʼs grew tenfold and he was highly regarded as a key awareness activist by Alzheimerʼs organisation globally. From adversity comes strength and Joseph, drawing inspiration from his father and reflecting on the strength and determination of his ancestors and in memory of their strength and courage to overcome insurmountable odds, produced his 1565 Patiently Waiting album. The album offered much diversity from the sweet balladry and powerful lyrics of the title track 1565 which was inspired by the true events of the 1565 Great Siege of Malta, to the tender Think Ahead to Go Ahead and the infectious pop rock sound of Rain. As his father’s health rapidly deteriorated, a family decision was made for his father to return to Malta. With the overwhelming absence of his father and the realisation that his father would not return to Australia, Joseph’s music was put on hold. In January 2013 his father passed away and it is fair to say that part of Joseph died with him. The former 10 years of having to deal with the deterioration of his father’s health, hit Joseph all at once. “It all became slow motion to me and I could barely get out of bed”. Pushing everyone away and even the one true friend he ever had - his guitar - became witness to the darkest days of his life. It was when he was introduced to Tiffany Cherry by a close friend, that Joseph felt that this meeting was the key to reigniting his passion for writing and playing music. Collaborating with Tiffany to pen his new single Happy New Year - a song about embracing the past and making it the foundation to a bright new future, putting the talented artist back where he belongs - in the studio and behind that mic, doing what he does best - telling his story through voice, lyric and melody. “Happy New Year” has seen Joseph embrace his ancestral past and develop a steely resolve to continue to write music and perform. This mirrors his very positive, spiritual and deeply passionate outlook on life. A seasoned international traveller and performer, Joseph has been invited and performed globally to audiences which have included exclusive performances to the then Maltese President Eddie Fenech Adami, Princess Yasmin Aga Khan, Lady Hilary and was asked to perform “You’ll never walk alone” in front of his Liverpool idol Ian Rush. Ultimately at peace with himself and armed with a clear vision of the road ahead, Joseph’s contemporary pop singer-songwriter style harks back to the 1970s and to watch and hear him perform is to witness the mesmerising aura that comes with the live experience’. His songs gently command your attention and, indeed, it is impossible not to draw comparisons with British songsmith James Blunt - though Joseph’s ever-growing allegiance of loyal fans around Melbourne will quickly point out that while “Blunt’s music swirls around the heart, Joseph’s songs will pierce it”. Though music comes as naturally to Joseph as eating and sleeping, the rawness in his voice and truth in his words comes from a place of emotional turmoil and life experiences, whereby Joseph channels honesty and experience into his songs.